For questions, technical support and custom orders, please email us at info@spinelelectronics.com or call 1-800-837-5859. 320X240 MJPEG @30fps, 640X480 MJPEG @30fps, 800X600 MJPEG @30fps, 1024X768 MJPEG @30fps, 1280X960 MJPEG @10fps, 1280X1024 MJPEG @10fps, 1280x1024 MJPEG @10fps, 1600x1200 MJPEG @15fps, 2048x1536 MJPEG @15fps, 2592x1944 MJPEG @15fps. YUV2 @ 30fps, 640X480 YUV2 @ 30fps, 800X600 YUV2 @ 20fps, 1024X768 YUV2 @ 10fps, 1280X960 YUV2 @ 10fps, 1280X1024 YUV2 @ 10fps, 1280x1024 YUV2 @ 10fps, 1600x1200 YUV2 @ 5fps, 2048x1536 YUV2 @ 4fps, 2592x1944 YUV2 @ 2fps. Night vision: No IR night vision, if needed, please contact us for a different IR lens and IR illumination options. Controllable Features: Brightness, Contrast, Saturation, Hue, Sharpness, Gamma, White balance, Backlight Contrast, Exposure. Power Socket: 4P PH 2.0mm socket, USB BUS Power. Cable Length: Default 4ft (1.2M) (optional 2M or others upon request). Supported OS: Win XP/Vista/Win7/Win8/Win10, Linux with UVC (linux-2.6.26 or later), MAC-OS X 10.4.8 or later, Wince with UVC, Android 4.0 or higher with UVC. Power Consumption: DC5V (±5%), 150~200mA. 5MP resolution, support 2592x1944@15fps, and YUV video streaming. 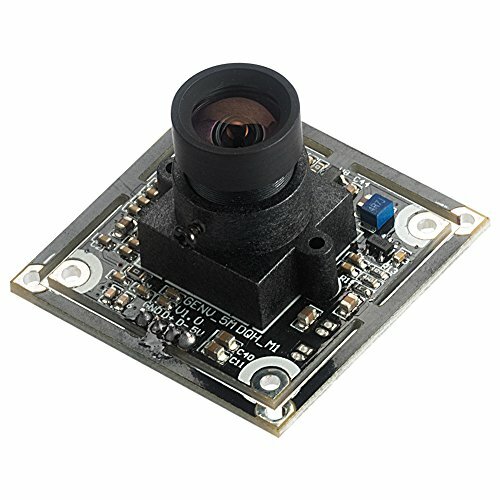 Plug-&-Play (UVC compliant), USB2.0 camera module with USB2.0 cable, cable length 4ft(1.2M). Non-distortion lens with IR-cut filter @ 650nm for true color day images/videos (Does not work with 850nm IR illumination), viewing angle 120 degree Diagonal, focus adjustable, focus range: 20mm to Infinity. Supported OS: Win 7/8/10, Linux, Mac, Wince and Andriod with UVC. Size: 38x38mm (mount compatible with 32 x 32mm), weight: 12g(0.4OZ). Part number: UC50MPB_ND. Offer custom solutions, please email to info@spinelelectronics.com or call 800-837-5859. If you have any questions about this product by Spinel, contact us by completing and submitting the form below. If you are looking for a specif part number, please include it with your message.